Most if not all of us have been with someone we have wanted to help through a difficult time. How should we best do so? What should we best say and how should we say it to comfort someone in destress? Or how should we best ask for or accept help when we need it? 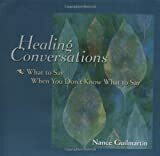 Nance Guilmartin has made a laudible attempt to describe numerous difficult situations and possible ways of dealing with them in Healing Conversations: What to Say When You Don’t Know What to Say. Sometimes it may be quite easy to comfort someone or give good advice, at other times it may be a whole lot more difficult, and in still more difficult situations, listening may be the only comfort we can give. Guilmartin emphasises the importance of listening and its healing potential. Showing that one cares in the appropriate manner can sometimes bridge a difficult communication gap. Listening is much more than just being quiet. It’s about paying attention to what people say, what they don’t say, and what they mean. It is important to any healing conversation. A meaningful conversation is much more than just talking or asking questions. The stories Guilmartin presents aim at making us more sensitive to how persons feel in similar situations, and in my opinion, they are effective in attaining their objective. The stories range from how to start a healing conversation, asking for help, a reminder that what comforts you may not comfort someone else, what to do when you don’t have the answers, to mention only a few. The problems dealt with range from coping with the end of a relationship, bankrupcy, a serious or terminal illness, facing surgery, waiting for test results, the difference between a cure and healing to how to be with someone in pain. Difficult conversations at work are also illuminated, e.g. when staff don’t get along, how to deal with angry customers, giving and receiving critical feedback, or dealing with the difficulties of being laid off. Difficulties arising from divorce, having to live alone, and the pains of death are also dealt with. The book is written in an easy-to-read style and aims to appeal to all of us who face difficult situations, not only at counsellers and therapists, although they are almost certain to benefit too from it. A list of useful sources is also provided at the end of the book. I recommend Healing Conversations as a well written, interesting and useful book. Markus Wolf recently attained his doctorate in philosophy through the University of South Africa (UNISA), one of the leading distance education universities. He lives in Austria where he now works as a general translator for the Austrian Federation of the Blind and Partially Sighted (Österreichischer Blinden- und Sehbehindertenverband) and as a general librarian in their audio library. His aim is to continue with philosophy professionally, either through a teaching position or as a philosophical counsellor.